A 17-year-old runaway who was arrested in connection with the campus killing of a University of Texas student has claimed that he was made to leave home in August because his grandmother's beliefs dictated that teens his age go "make their own way in the world," court records obtained by the Associated Press detailed. "The child reported the grandmother's religious beliefs, when a person turns 17 years of age, they must leave home and make their own way in the world," the affidavit says. Meechaiel Criner told authorities that in August he hitchhiked and walked some 300-plus miles from his grandmother's home in Texarkana to Austin because his grandmother, Mary Wadley, kicked him out. Wadley had reported him as a runaway that same month, telling authorities that she was Meechaiel's guardian, and the report needed to be made so that she wouldn't be held responsible when he did not appear in school, Texarkana police said. AP notes that records detail a troubled upbringing for the teen, who had been in custody of child-protective services before being reported as a runaway. Meechaiel's family reportedly had an "extensive history" with the Texas Department of Family and Protective Services when the state asked a judge to take over his care and separate him from his relatives. The state had investigated several allegations of abuse and neglect involving family members over the years. Meechaiel told authorities in August that he had been living with his grandmother at a home where his aunt also sometimes lived and that he had been taken away from his mother when he was 2. Meechaiel's mother tried to take him back in 2011, but when Meechaiel refused, his mother allegedly threatened to put him in state care. "I am going to make sure you go to foster care," Vivian Criner told her son, the affidavit claims. 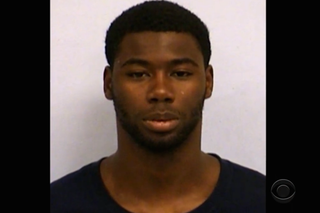 Now the teen is expected to be charged with murder in the death of 18-year-old Haruka Weiser, a University of Texas dance student from Oregon, whose body was found in a creek on campus April 5. Authorities have not released an alleged motive for the killing. Wesier was last seen leaving the campus drama building on the night of her death. Campus surveillance video showed a man, believed to be Meechaiel, watching a woman, believed to be Weiser, as she walked toward her dorm with her head down, looking at her cellphone. According to the affidavit, as the woman passed, the man produced "what appeared to be a shiny rigid object" and followed her. The pair dropped out of view when they reached the bank of Waller Creek. The man wasn't seen on video again until some two hours had passed. Weiser's body was found two days later in Waller Creek near the campus alumni center and football stadium. Meechaiel was arrested April 7 at a shelter near the campus with some of Weiser's belongings, including her blue duffel bag. He is currently being held on a $1 million bond.